After having seen the movies “Taken 1, 2 and 3,” I started thinking to myself: “how far can they go with the Taken Movies?” It seems that they have been doing a great job at the box office, and it appears people are enjoying those kinds of movies. Liam Neeson is a great actor and being in any movie really, changes the caliber of that movie. But the question remains, if there were to be a prequel to the taken movies, what would it be like? And what would it be called? We all know there are no negative numbers in a movie’s title. If it was a comedy then we could perhaps entertain the idea but it’s not. For this reason, If I were to come up with a prequel for taken, I would use the name that a close friend of mine suggested “Given”. The story will be about the young Liam Neeson character, early on in his life, recently married. One day he hears a knock on the door. His wife asks him to check it out, and like any normal tall person he opens the door without looking down. He thinks it’s a prank at first, until he hears the sound of a baby crying. He looks down and sees this cute baby in a basket with a note in it “this baby has been given to you” something like “tag, you’re it”. Now we all know Neeson’s character; since he doesn’t appreciate things taken from him, he wouldn’t like things given to him either. So he researches the hand writing and discovers who the real parents are. He digs further and gets the cell phone number then calls them up and says: “Hey, I will find you, and I will give you this baby back”. Here is a fun and easy recipe to do. 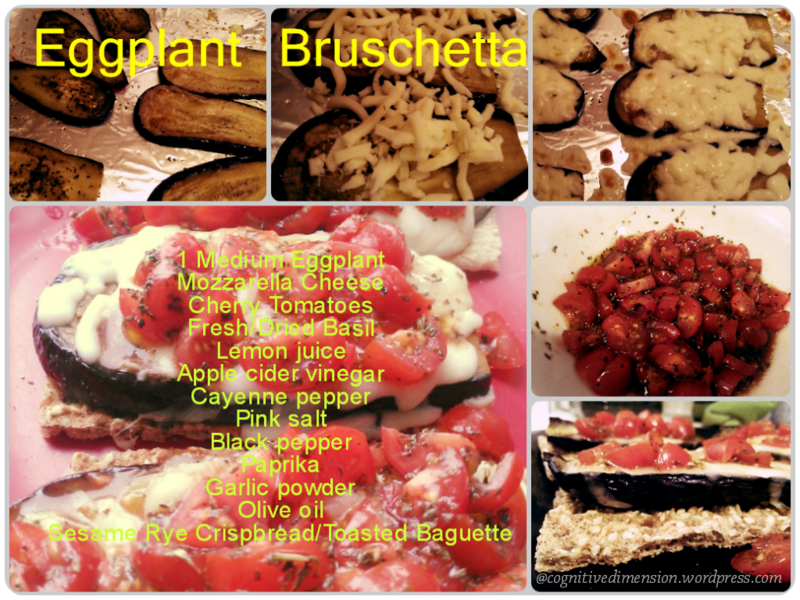 Eggplant Bruschetta is one of my favorite appetizers and sometimes just a good old plain meal. Slice the Eggplant as thick or thin as you like. Put them on a tray and sprinkle some salt on them. Leave them for 20 minutes so that the excess water in them comes to the surface. Pat dry. While the eggplants are baking prepare the simple tomato salad. Cut cherry tomatoes into piece. Add juice of 1 lemon, a bottle cap of apple cider vinegar, a dash of cayenne pepper, pink salt, paprika, garlic powder, and black pepper. Add chopped basil or dried basil. Drizzle with olive oil. Remove the Eggplants when done. Add a handful of mozzarella cheese onto each eggplant and return to the oven. Wait until you see that the cheese has melted. Remove from oven and put the Eggplant/Mozzarella onto the crisp bread. Add the tomato salad and devour. Plan your Christmas party and menu three or four weeks in advance to cut stress, create delicious healthy meals, and make the holidays enjoyable and relaxing. You can spread the chores over the weeks leading to Christmas and tick off your to-do lists day by day and one by one. One thing you want to get out of the way is the menu plan for the special day. In addition to Christmas dinner, you may also need to prepare special healthy recipes for Christmas day and the following days leading up to the New Year. Determine how many people you will be serving for which meals and find out if anyone has special dietary needs and particular dislikes. To keep a tight budget, plan to have leftovers that can be used for the next day or the following days as a basis for a new meal. 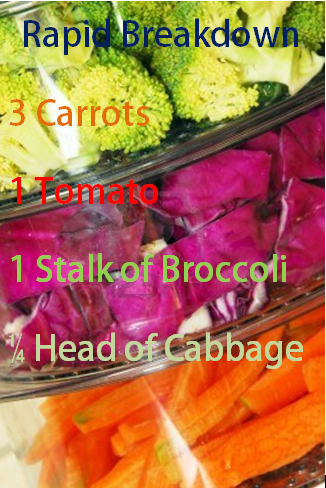 You can turn most dishes into healthy food like sandwiches, salads, soups, or casseroles, for example. You can also plan dishes that you can prepare days in advance and freeze without losing quality and flavor. This way, the less you will need to do on the big day itself. Decide on a theme for the party, whether it is a type of cuisine, whether you are leaning towards traditional or contemporary, and what kind of colors, motif, and ambiance you are aiming towards. 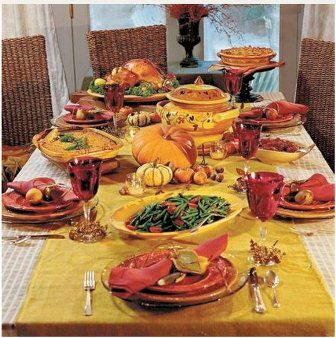 Plan the table settings and decorations ahead and list down all that you need for the occasion including silverware, glassware, china, tablecloth, napkins, serving plates, salad bowls, candelabra, candles, flower vase, flowers, centerpieces, and so on. Write a timeline and to-do list of all the tasks you need to do such as shopping, organizing, gift- wrapping, and cooking. Divide the tasks into those that can be done in advance and those that need to be done on the day itself. Spread the shopping over the few weeks to stay on budget and beat the rush. Choose healthy food like salmon, glazed ham on the bone, prawns, fish, turkey, fillet of beef, lamb, berries, apricots, prunes, currants, nuts, figs, melons, pears, mangoes, avocados, asparagus, green beans, chestnuts, mushrooms, fresh herbs, tomatoes, and potatoes. My name is Katy Cavallero from Toronto, ON Canada and a part time photographer. Being a good photographer is definitely not easy. I also joined the staff of a business magazine which was based in London and became a corporate photographer. During free time, I create blogs and post contents related to foods. 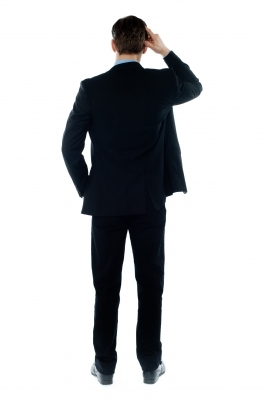 It is my pleasure to share valuable information, knowledge and tips to this blog community. So they’re spying … big deal! Lately, that’s all we hear about on the news, how the US is spying on almost everyone on earth, even its closest allies. Well to reassure everyone, the USA just like any other country is also spying on its own people. In other words, they are employing the “equal spying opportunity” and that is something anyone spied on should feel proud of and should take advantage of. But I am still not happy about that for one main reason. A few days ago I got the flu, and I was shivering in my bed with a high fever. I couldn’t even make it to the kitchen to prepare myself a soup or even get my own medication. Did they check up on me? No. Did they send me any medication? No. Did they at least send me a “get well soon, card”. No, Nothing. I got nothing from anyone. Yet we both know that they know I was sick. That same night, my one year old son started crying in the middle of the night, in his own crib. 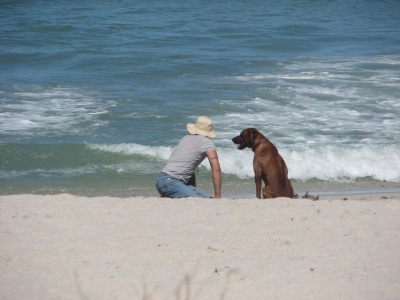 I felt helpless towards him. 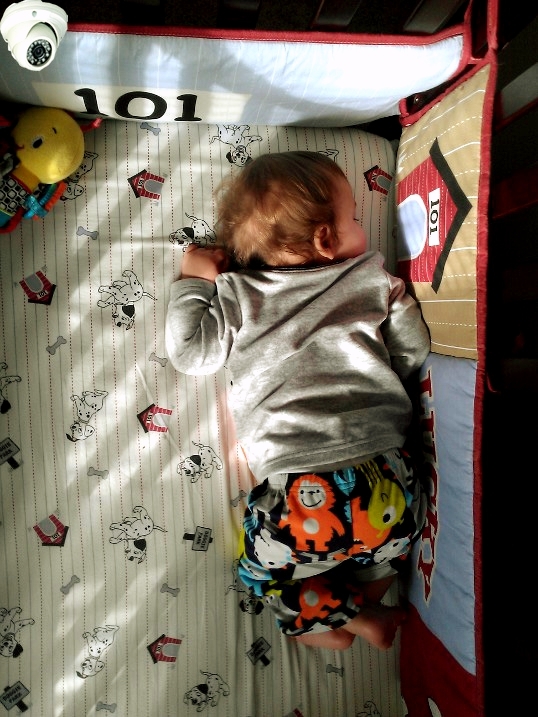 I wanted to go pick him up, but I couldn’t for two reasons, I was extremely sick, and I didn’t want to spread my virus or whatever I had on to my son; but I expected uncle Sam who spends sleepless nights watching us and over us to at least send in a Nanny to soothe my child back into sleep. Unfortunately, that didn’t happen either. Now tell me, am I asking for too much here? Isn’t that why they are spying on us? Isn’t it to provide us care when we need it the most? 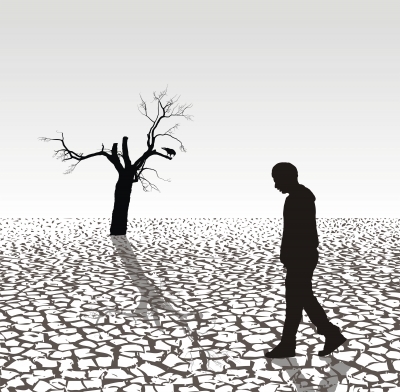 If every Lebanese was asked to write down the names of five people he/she would like to see dead before the end of the day, knowing that their request would be granted, I guarantee you that the following morning we will wake up to a country with not one politician left. Now one might think that every Lebanese person hates the entire political crew, but this is where you’d be wrong. They only hate the parties that do not represent their religion and sect in particular. If they have it their way, they would rather eliminate any obstacle or in this case any other party that stands in their affiliation’s way. Being a Lebanese myself, I think I can somehow project how the majority of Lebanese think. To begin with, I will keep two names aside just in case something arises at a later point. 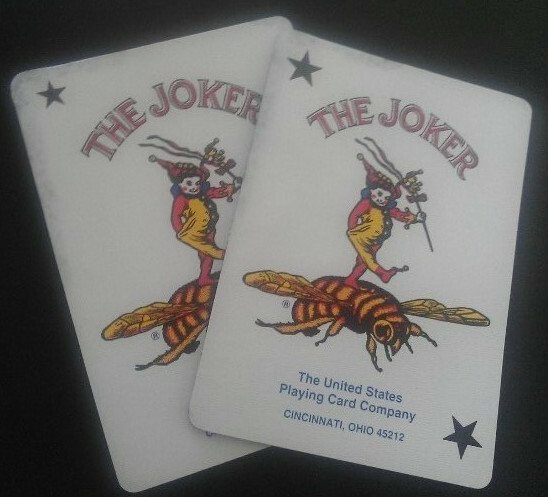 Those would be like the Jokers in a deck of cards that I can use whichever way I want and whenever I please. So now I am left with three names to write down. I can’t just go ahead and write down the names of the high ranking politicians, because one way or another it would be redundant for I am sure someone else will have them on their list. Why one might ask? Simply because that person might have had a project that was turned down, or was asked for some percentage in return for a simple signature on a form. I guess you get the point; these officials have their own haters. So those high ranking ones will be cleared out by others, if not, that’s where my two jokers will come into play. I would only need to choose only two names simply because any Lebanese will select only two of the top three but never all three at the same time. Next we’re left with the parliament members. There are only a few of them compared to the 4 million people in Lebanon and the remaining 6 million outside of Lebanon who have a list of 3 blank names left, which makes up around 30 million variations provided they all keep two names as backup jokers. But we all know that the Lebanese don’t trust each other. So even if you write a name down, another person will definitely write it down too, just because you can’t be too careful and it’s better to be safe than not. It’s like double checking. Since the Lebanese are known to be very smart, they know better not to waste their time with a name of a politician that represents a section, a city or a village other than theirs because they know for a fact someone from that area will get to the name, so they try to keep it local. If however, the politician that represents them has won the last election and is currently a parliamentary member, they would then write the names of his 3 top members of the opposing party. If their representative failed in the last election, then it goes without saying that the currently serving will make it to their list. In some cities and villages or sections of Lebanon, there is an overwhelming majority of one party. Of course those choosing the names wouldn’t wish anything bad to their leaders, so they will start writing down the names of the leaders of the opposing parties. So far, we have the top 3 positions eliminated, then the leaders of all the parties, then all the parliament members as well as their next in line or their competitors. But what about the politicians that still exist, those we barely hear their voices or see their faces, they could very well surface when the dust settles? Again, the Lebanese have a solution for that. And with that solution comes money. So just like money floats around during the election season, money will start playing an important role. You will see people filling out the list of five names and will actually buy a couple more lists from people who are financially in need. They would manipulate their cousins and family members to fill out names they haven’t selected themselves. 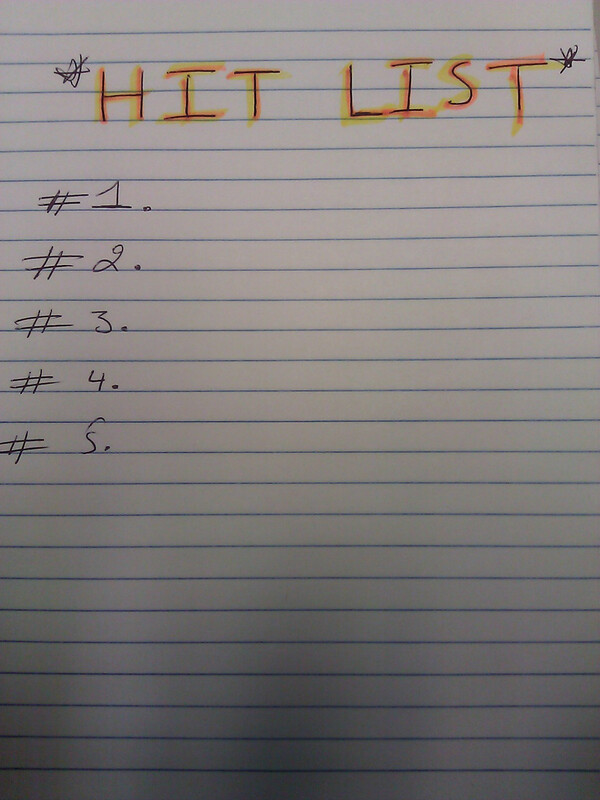 After all it seems like they want to diversify their lists. That way, they can surely get a goodnight sleep knowing that every name they can think of, gets shot, stabbed, or blown up. The end result will be a new day with no politicians, but the question remains, how long before we see the same flags being raised again and a new government with new names being formed? If I were to answer that, I would say before sunset of that same day, because our governments are not formed within, they come pre-packaged and poorly wrapped from the different corners of the world. Who wouldn’t wanna shed a few pounds? I do not believe in diets… I believe in the approach. If you adopt a healthy approach and lead a lifestyle full of healthy nutritious food and actively working out you will automatically lose weight and keep it at bay. Healthy eating and working out are the two essential ingredients for looking and feeling good. Here are a few juice recipes that will aid in the process of weight loss. 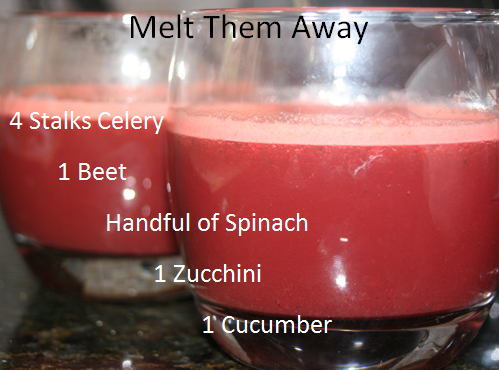 Try juicing celery, a beet, spinach, zucchini and cucumber. Your system will clean itself out. You will feel refreshed. 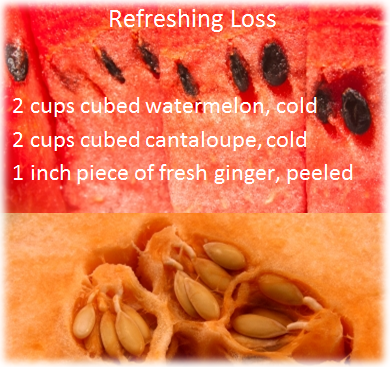 Watermelon and Cantaloupe with a kick of ginger will provide your body with essential nutrients and aid in weight loss. No to mention its refreshing taste on the palate. Someone should come up with a superhero carrot cartoon character. Carrots are full of so many nutrients and help in preventing and reversing so many diseases. 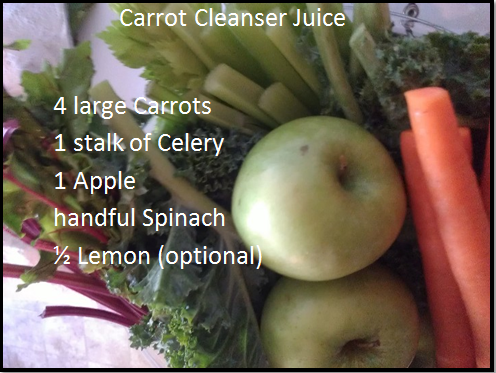 Carrots, Celery, Apple, Spinach and Lemon are to be juiced together and consumed quickly so that all the nutrients would pass through your system and help your cells replenish and stabilize.